With all the turmoil in the financial industry, you would think that there would be a national conversation of money and lending. You would think that this would be a good time to re-examine the way we create money and the way we lend it. You would think, especially, that it would be a good time to review the subject of usury, especially since the credit card market is about to collapse in the same way the mortgage market did. But no, that conversation has not taken place. 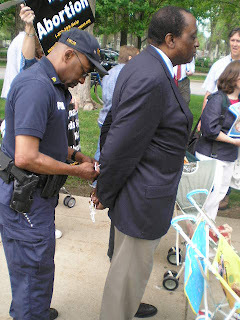 On Friday May 8, Alan Keyes was arrested at Notre Dame protesting the university’s decision to honor President Obama with the commencement speech and an honorary law degree. Obama is scheduled to be appear at Notre Dame on May 17. Dr. Keyes arrived at Notre Dame with a sizable cadre of pro-lifers, many pushing strollers containing baby-dolls smeared red to indicate the blood of the unborn slain daily in abortion. Others held signs saying,“I regret my abortion”. The protestors peacefully walked onto Notre Dame’s campus praying together the Rosary. Upon entering the campus, Keyes was arrested for trespassing by Notre Dame University police. Keyes held his rosary as he was handcuffed from behind. About 15 others were handcuffed and arrested with him.